Disney Beanies (or by their correct title, Disney Mini Bean Bag Plush) have become the biggest selling item in the history of the Disney store. Helped by a general interest in other Beanies, principally Beanie Babies from Ty, the Disney Beanies have quickly become very collectible. The line was originally tested in 30 Disney stores in May 1997 and was released nationally in the US later that year. They started arriving in other Disney stores throughout the world in 1998, although the range is far smaller than that available in the US. 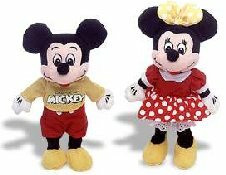 also a number of limited editions for specific seasons such as Xmas Mickey and Minnie. A number have also been retired and a secondary market is already well established. A number of Disney Theme Park exclusives have been produced, as well as a number of country specific exclusives. Country exclusives are proving very popular, especially the Japanese Disney Beanies. In the UK, limited edition Mickey and Donald Football (Soccer) Beanies appeared in 1998. News of the edition spread to the US and in a matter of hours, the line had gone. There have already been a number of updates on the ealier Disney Beanies to correct mistakes and add features. The earlier models will be very sought after by completists. New characters are appearing fairly frequently. With so many famous characters to choose from, collectors should remain interested, and the amount of new collectors should grow.